For about two-thirds of all households in the United States, home includes a pet, most commonly a dog or a cat. Typically, more men own a dog, while women more commonly own cats. Baby Boomers, those men and women now between the ages of 52 and 70, represent the largest segment of pet owners. Of those people 65 and older, about a quarter own a dog, a fifth own a cat. The reasons for owning a pet are many – companionship, pleasure, security. But for many people, those words don’t adequately explain what it means to have a dog or cat living with them. Let’s just say, their life would be incomplete without a four-legged family member. Read our new Why Pets Make Us Healthier and Happier guide and learn the facts that prove the benefits of pet ownership. You’ll find some of these people living in the pet-friendly retirement community of Kendal at Oberlin. When an abandoned 6-week old kitten was found in a ditch on the campus, Nancy Garver was one of the first on the scene. 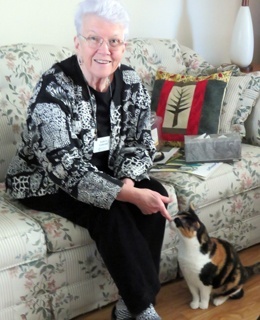 The Kendal resident has lived with cats all her life, or as she puts it, “the cats have allowed me to live with them.” She is also a volunteer for an Oberlin cat rescue and neuter organization called Community Action to Save Strays (CATSS). Miss Kendal is now 10 years old and lives with Nancy and her other cats in a cottage. “Their purring is very soothing,” she says. The cats’ presence is soothing, too, she said, recalling the weeks before her husband, Len, died and how one cat greeted her by standing on a table, and stretching his paws to touch her shoulders. For the past 8 years Nancy has been involved with CATSS. When a mother and babies are rescued, Nancy often takes them home until the kittens are weaned and can be adopted. Those babies without a mother are bottle-fed by Nancy and other volunteers. “I’ve been most lucky finding homes for many of them at Kendal,” she says. Another source for adoption are Oberlin College students. They can’t keep pets in college-owned housing, but students are vocal advocates for finding homes for the cats and kittens. For instance, a student’s grandmother in California adopted one cat. Kittens awaiting adoption are housed in a room behind Ginko Gallery, which is owned by Liz Burgess, CATSS president. 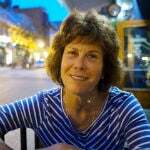 (Liz is also chair of the Kendal Board of Directors). Ed Friedman and his wife, Lois, moved to Kendal nine years ago. The most direct path to walk from their cottage to the main building for dinner, mail and the like, runs right through the Stephens Care Center. Thus began Eli’s second career. The Golden Retriever’s first career is show dog, specifically in obedience and rally. Now, the semi-retired, 11-year-old dog spends most of his time greeting residents and staff in the care center during his twice-daily walks through the building. Eli’s temperament and obedience training made it easy for him to adjust to his new job. “They are always glad to see him and vice versa. Eli is always happy, and now he has more people who are happy to see him,” says Ed, who is usually the one holding the leash because he is retired. Lois works part-time as a psychologist. Sometimes the exchanges are more poignant. Ed recalls a visit when Eli jumped up on the bed of a resident who was dying. The resident was not able to talk, but did lift his hand to pet Eli. “I’m not the one doing anything special. Eli is the star. I’m the person who escorts him, and it’s very gratifying,” Ed says. The couple has been married 40 years, and has always owned a dog. “I can’t imagine not having a dog,” he says. In fact, their courtship started with a dog. Ed and Lois were graduate students in Houston and during Ed’s first visit to Lois’ apartment he met Barney, a 90-pound German Shepherd. “If he doesn’t like you, that’s it. This is a deal breaker,” Lois told Ed.